The Hillbillies refer to people living in the rural and mountainous areas of the United States. As a stereotype they are unsophisticated and poor but carefree. They live off the land and have a culture of their own. This image of the hillbillies has been superbly recreated in this slot game from Real Time Gaming. The reels are set against the background of typical hillbilly countryside. The three hillbillies are both the wild and the scatter symbols. The hillbillies are Granddad, Girl and Bloke. They live in an old mining Hut with their Dog and Pig. Hillbillies are known for their fondness of Moonshine. The high value cards from Nine to Ace also appear as symbols on the reels. The coin size ranges from 0.01 to 5.00, which offers considerable flexibility to players. Even greater flexibility is offered to low rollers because all sizes from 0.01 to 0.10 are covered. 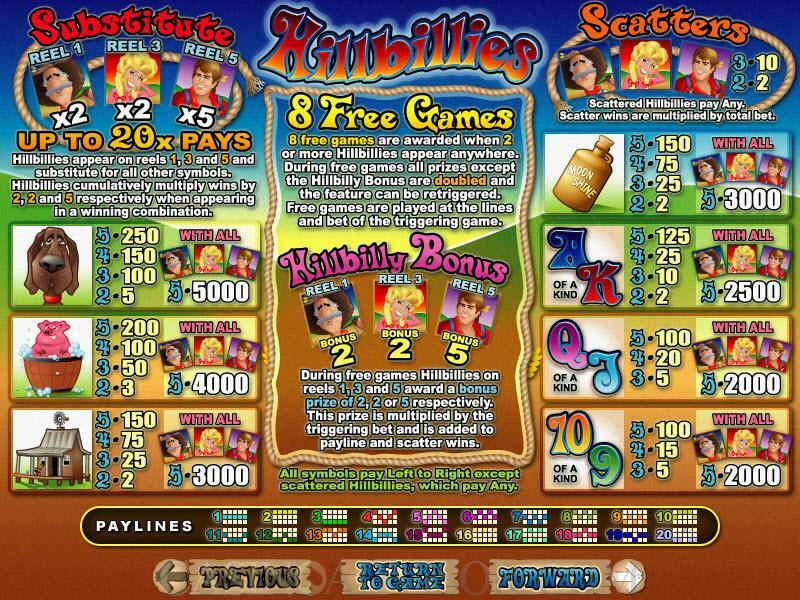 Hillbillies offers 20 paylines, which is in the middle range as far as contemporary slots go. Players have to wager only one coin per payline. Granddad appears only on reel 1, Girl appears only on reel 3 and Bloke appears only on reel 5. All three act as wild and scatter symbols. As wild symbols they do not offer payouts in themselves, but when they complete winning combinations with other symbols they multiply payouts. Granddad multiplies payouts by 2, Girl multiplies payouts by 2 and Bloke multiples payouts by 5. 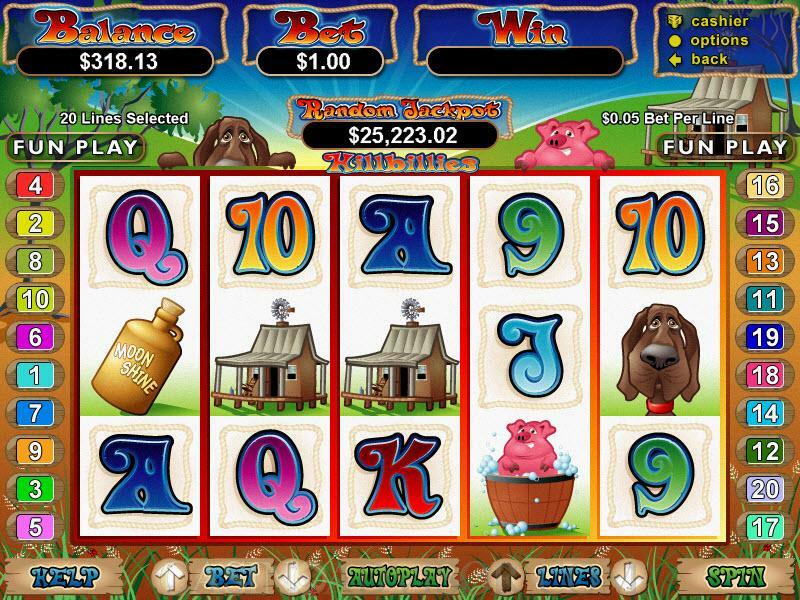 Hence when all three hillbilly symbols appear in a winning combination the payout is multiplied 20 times. As scatter symbols hillbillies offer scatter payouts. 2 symbols payout 2 coins and three symbols pay out 10 coins. The payouts are multiplied by total bet to convert to credits. Two or more hillbilly symbols appearing together trigger the free spins bonus round. Eight free spins are offered at doubled payouts. The free spins round can be retriggered if two or more hillbilly symbols appear together during the free spins. If Granddad appears in the free spins the player will get a one time bonus of 2 times the triggering bet. If Girl appears in the free spins the player will get a one time bonus of 2 times the triggering bet. If Bloke appears in the free spins the player will get a one time bonus of 5 times the triggering bet. The hillbilly bonuses are not doubled. 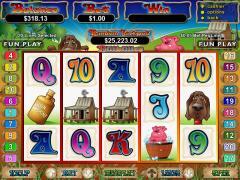 Hillbillies online slot game offers the Real Time Gaming progressive jackpot. This jackpot can be given randomly at the end of any spin irrespective of what combinations appear in the paylines or the amount wagered by the player. Interested in reading more detailed information about Hillbillies? If so Click Here for more details.